In Q1 of 2017, 373 homes sold in Wesely Chapel. 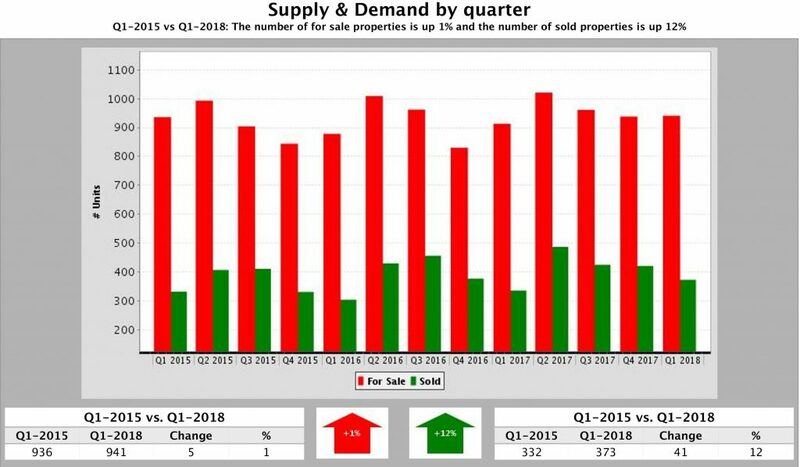 If you look at the bar graph below you’ll see that was more than sold in Q1 of 2017. During the first quarter of 2018, there were 941 homes listed for sale. 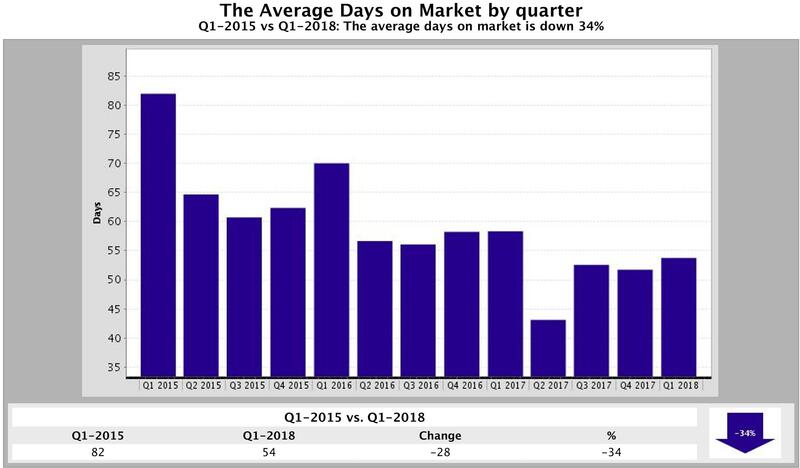 That was also more than in Q1 of 2017. So with the first quarter in the books, 2018 home sales in Wesley Chapel have outpaced 2017. So where does that leave levels of inventory or the number of homes for sale going into the peak of the home selling season? 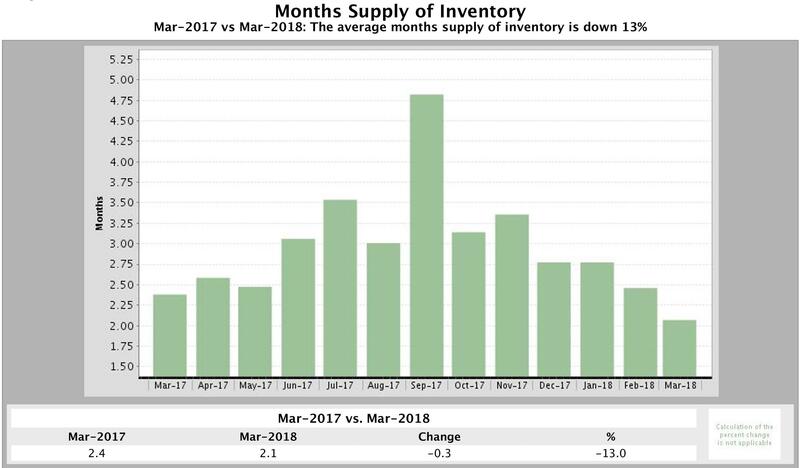 In chart 2, you’ll see that if homes continue to sell at their current pace the inventory will run out in 2.1 months, which is 13% faster than in March 2017 when it would have taken 2.4 months. 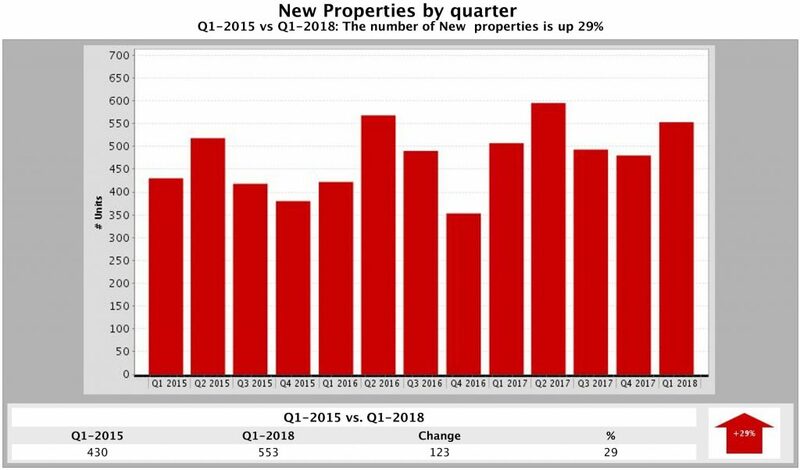 But in Q1 of this year, 553 homes came on the market, while just over 500 did so in Q1 of 2017. So more homes came on the market, but inventory is still down by 13%. 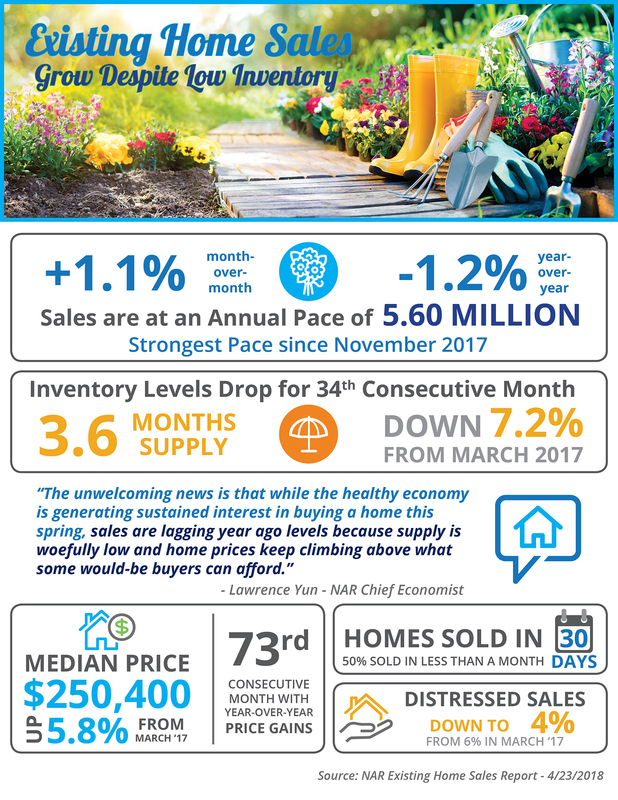 So even though, more sellers listed homes than in 2017, the current pace of sales kept inventory levels low. Also, the Average Days on Home Stays on the Market dropped too. In Q1 of 2017, homes stayed on the market a little under 60 days on average, but in Q1 of 2018 just under 55 days. So far this year, Wesley Chapel’s housing market has outperformed the 2017 housing market on a quarterly basis. Prices and the number of homes sold both moved higher. This seems to indicate that Q2 will be more of the same. The only concern, as I’ve said before, is at what point will the lack of housing inventory start to dampen sales. 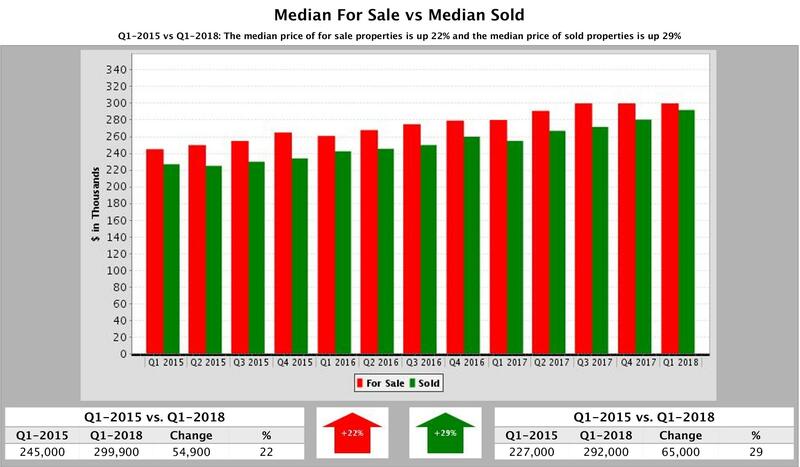 But the market has favored sellers for the last year and it is unlikely you will find a better time to list and sell your home than in Q2 of 2018. Now here are some of the most helpful and interesting blog posts, articles, and infographics we’ve run across this week. Enjoy! As construction begins on Water Street Tampa’s buildings — 10 in the coming year — the street grid near Amalie Arena is changing, starting with E Brorein Street. Workers have closed Brorein from Channelside Drive to S Nebraska Avenue. The closure is part of tens of millions of dollars in road, water and sewer work that started within Water Street Tampa’s 55-acre footprint in August 2016. “This initial realignment represents a significant step forward in creating the new, more functional street network throughout the area and in creating the actual building blocks for Water Street Tampa,” project spokeswoman Ali Glisson said in an email. In addition to Brorein, one westbound lane of Channelside Drive has been closed from S Meridian Avenue to Old Water Street, and the four lanes of traffic that remain open on Channelside have shifted a bit south. To keep westbound traffic moving during the morning rush hour, no left turns will be allowed from westbound Channelside onto Old Water street from 7 to 9 a.m. on weekdays. In coming months, Channelside itself will become a two-way road between Nebraska Avenue and Old Water Street. North of Channelside, Nebraska will become a one-way road going north. Before it’s done, the infrastructure work will resurface more than 2 miles of roadway, replace pipes that are 65 years old and add 3,269 feet of bike lanes at Water Street Tampa. What if both rates and prices increase as predicted? The percent increase in mortgage payments would negatively impact affordability. But, how would affordability then compare to historic norms? 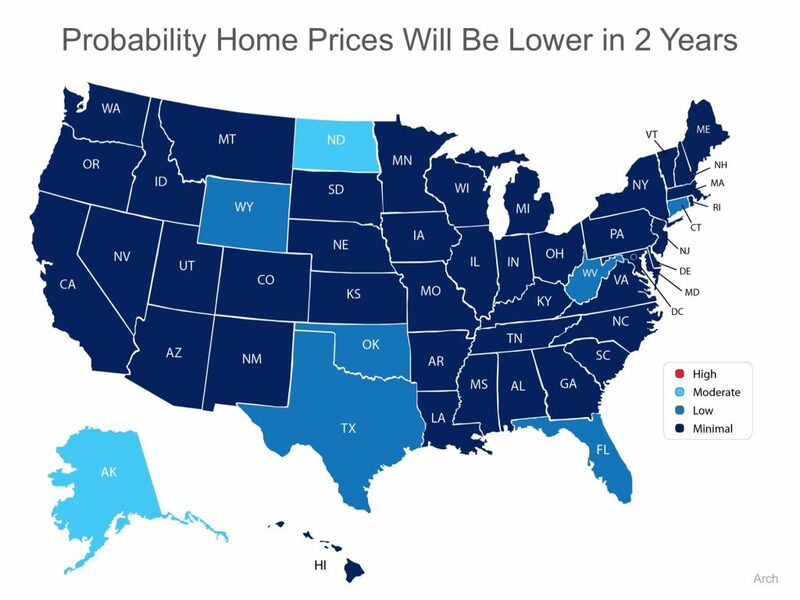 To this point, Arch Mortgage Insurance also revealed their Risk Index which estimates the probability of home prices being lower in two years. The index is based on factors such as regional unemployment rates, affordability, net migration, housing starts and the percentage of delinquent mortgages. If interest rates and prices continue to rise as projected, the monthly mortgage payment on a home purchased a year from now will be dramatically more expensive than it would be today. Home shoppers outnumber home sellers in many places. If you’re a home buyer, you need every competitive advantage you can get. That’s why it pays to know how to find motivated sellers and persuade them to choose you. The definition of “motivated seller” has changed since the depths of the economic crisis about a decade ago, when many motivated sellers were trying to avoid foreclosure. There are fewer of these desperate sellers now, but you can still find motivated sellers if you know where to look. This year, designers are leaning into streamlined simplicity. Looking for a fresh start for the new year? Consider upgrading your kitchen. Those Shaker-style cabinets should be the first thing to go, and you’ll probably want to give the dramatic paint trend a try. Here are some trends professional designers say we’ll be seeing a lot of. 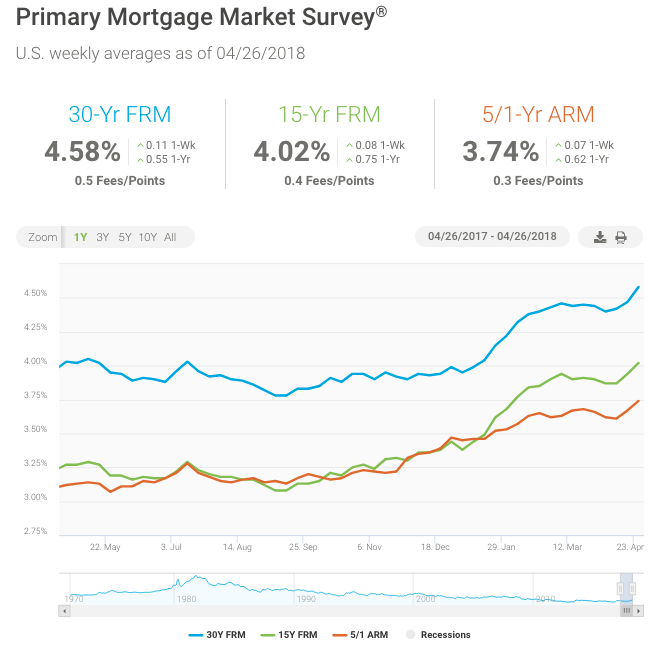 Mortgage rates increased for the third consecutive week, climbing 11 basis points to 4.58 percent. Rates are now at their highest level since the week of August 22, 2013. Higher Treasury yields, driven by rising commodity prices, more Treasury issuances and the steady stream of solid economic news, are behind the uptick in rates over the past week. Despite the increase in borrowing costs, demand for home purchase credit remains solid. The Mortgage Bankers Association reported in their latest mortgage applications survey that activity was up 11 percent from a year ago. Thanks for reading Tampa Market Monday. We’d love to help you buy or sell your home, so please get in touch! You can reach me, Doug Bohannon or Dale Bohannon at 813-979-4963 or by completing this contact form. Thanks for taking time to read the Tampa Market Monthly! 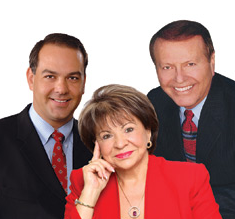 If you want to buy or sell a home or find out your home’s value please let us know. We’d love to work with you. You can reach me, Doug Bohannon or Dale Bohannon at 813-979-4963 or by completing this contact form. You can search all Tampa area homes for sale at www.teambohannon.com.